In this video are some production shots taken with my iPhone, you can see my camera angle, then the view from the camera, and the final edited shot. I also included some video taken from the bucket truck a.k.a. cherry picker. The music is the canned music from iPhoto, but I got a message that this video is banned in Bermuda, Canada, Germany, Montenegro, Saint Pierre and Miquelon, Serbia, United States, United States Minor Outlying Islands. Well howdy doody, the iPhoto music set off some type of YouTube sentinel, so now I’ve gotten myself banned. Well there is a first time for everything! Who’s stupid idea was this?! Today’s post was supposed to be a video of a staff member playing one of the holes on the course, but due to internet connectivity issues, I’m lucky I can even load a photo, I am instead sharing this new photo of the 2nd green. 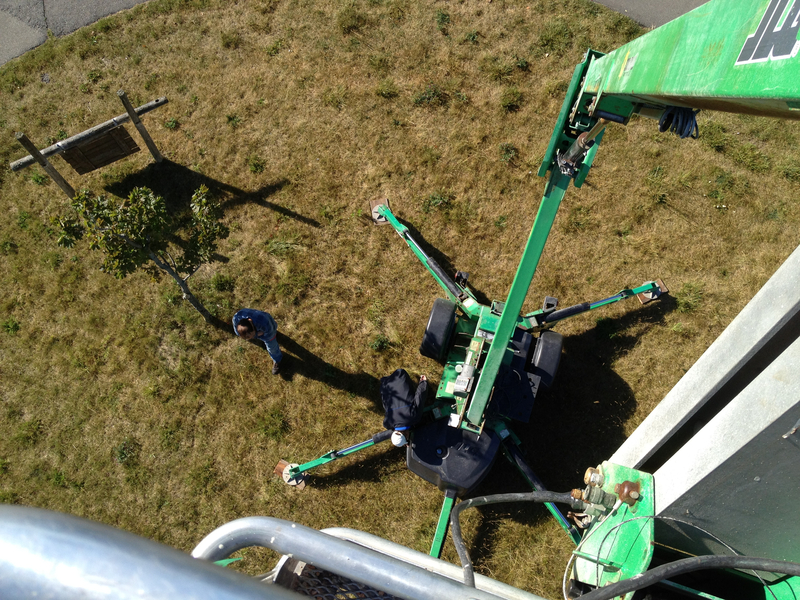 Two weeks ago we rented a bucket truck, better known as a cherry picker. It’s the kind of truck you see by the road working on power lines. The idea was for me to get in this bucket, go up in the air, and get some killer photos of the golf course, you know, the kind you can’t get from the ground. Before I went up, James taught me trucker hand signals because they wouldn’t be able to hear me from so far up. So I climbed in the bucket with all my gear at 5:40 in the morning, and they hoisted me up. I looked around, gulped, and yelled down, “Who’s stupid s___ idea was this? !” Well, of course it was my bright idea. So I stuck it out. Here you can see my set up. 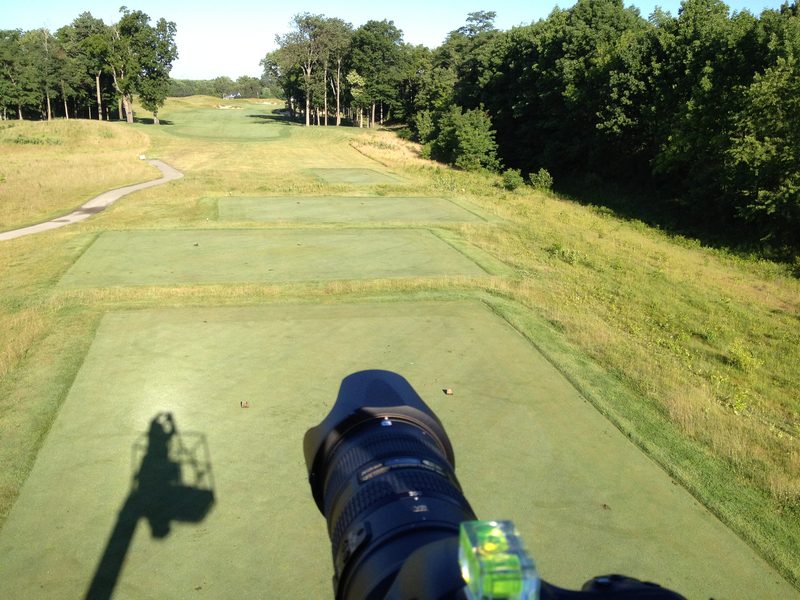 Yes, believe it or not, I got that shot of two green from way up here with this camera. The production shot you see here is taken with my iPhone. In this shot looking down 4 fairway you can see the shadow of the bucket truck. 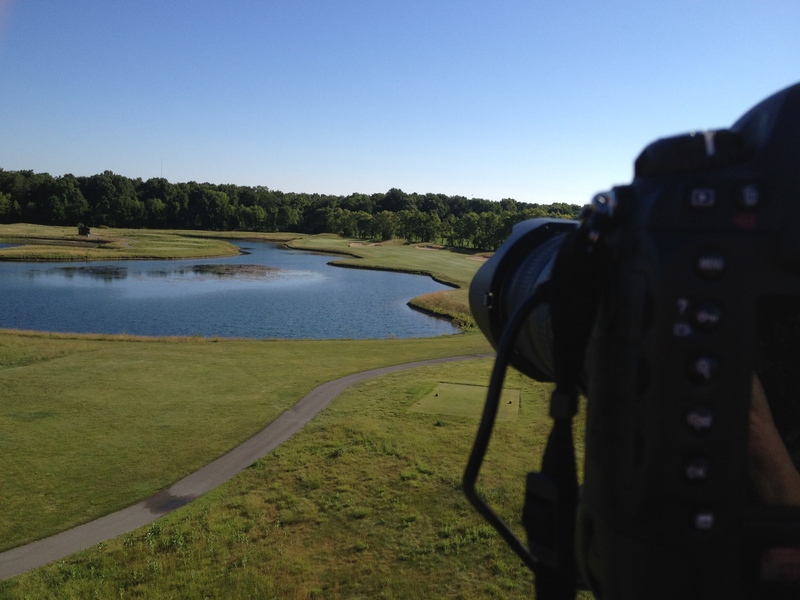 We held off the maintenance crew, and closed the course until 9:00 that morning so that I could shoot unhampered. And we went around and shot the whole time. I’m still editing photos. The funny thing was, we were finally finished at right about 9:00, and I yelled “Guys, I’m ready to come down!” They went to start the engine, and it wouldn’t turn over. I yelled “That’s a bad joke, right?” Well, it wasn’t. It was out of gas. Luckily it only took about 5 minutes for them to get gas and I was down. I got some amazing shots, ones I couldn’t have gotten from the ground, but I’m in no hurry to do that any time again soon! 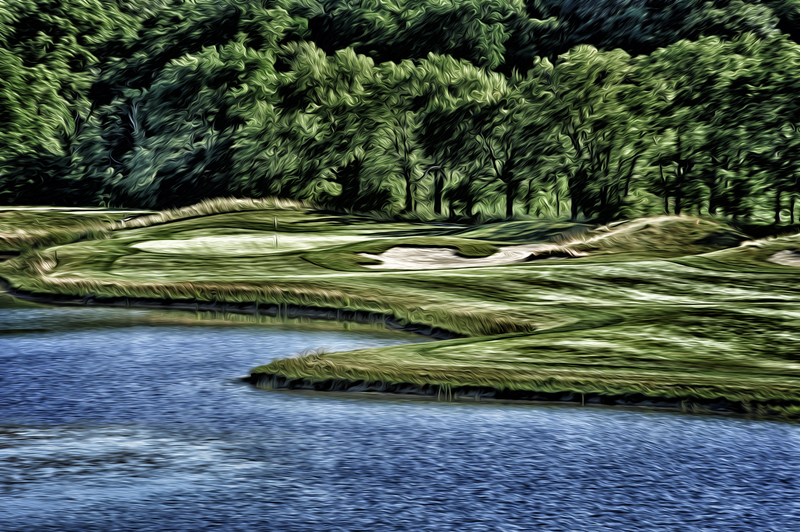 Today we bring you another frequent players approach to playing one of the holes at Purgatory Golf Club. Junior golfer Clay Merchent discusses his strategy as he warms up on the driving range, and then chips and putts in preparation for his round of golf. We join him on the 14th hole, where he makes it look easy to get a par on this long par 5. We hope you like our video, and thank you to Jo Jo for being behind the camera on this one! In this short video you get to meet our new Executive Chef Tom Smith as he shows you a little behind the scenes action in our kitchen as they prepare for an upcoming wedding. In this video they are smoking meat. Get to know Blair Shadday as he warms up on the driving range, putts, and then shows us his strategy on the very long 13th hole. In this short video you will get to see the awards ceremony from the recent sectional and meet some of the winners. Hope you like it! Three teams will qualify for Friday’s regional at the Player’s Club in Muncie. The three lowest individuals (not on advancing teams) will qualify for Friday’s regional. Team score: four best scores of five player team. We will have more photos, video, & coverage of the outcome tomorrow. Good luck to everyone, and have fun! We’ve been working very hard behind the scenes to get our new on-line store up and running. We are working with a great company Cafepress, that will put our award winning logo, and artwork on an amazing array of items, from the usual t-shirts, to dog bowls, bumper stickers, serving trays, dog t-shirts (yes, a t-shirt for your dog! ), boxers, briefs, thongs, pajamas, steins, glasses, you name it, and they can logo it or put artwork on it for us. The behind the scenes work is quite detailed, and extremely time consuming. Most items require the image be sized just for that item, uploaded, named, described, tagged, organized, needless to say it’s quite detailed work. So if we made any mistakes in the tagging or other dreary details, please let us know. Also, if you see something that you would like with a different piece of artwork of ours that you have seen on Facebook, Twitter, Flickr or at http://tennamerchent.smugmug.com/ let us and if we can, we’ll make it for you. We really hope you like our new store, it has such fun stuff in it, it’s already making my credit card smoke!